The drone is going mainstream. Pilotless aircraft - known until now primarily for their controversial role in American foreign policy - are now being integrated into American life. 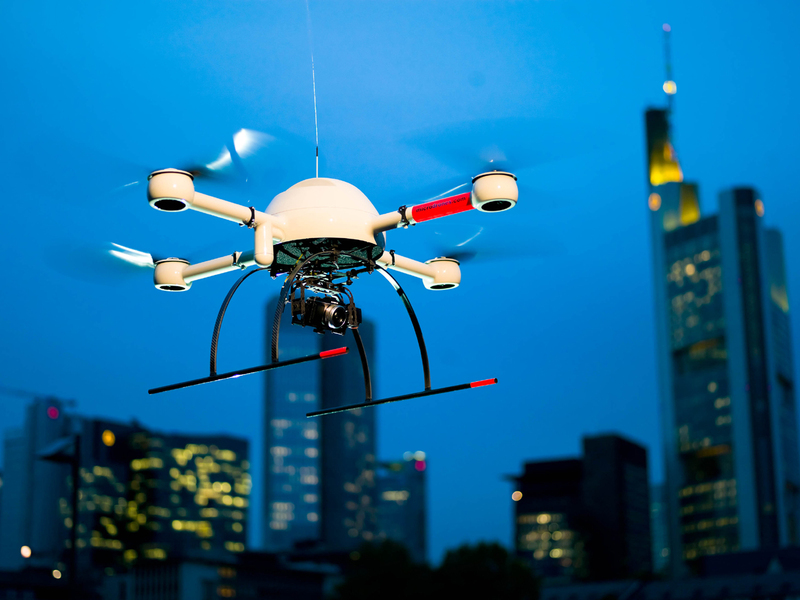 The Federal Aviation Administration expects there to be 7,500 commercial drones operating domestically by 2018. Already, drones are being used by real estate agents to make videos of high-end homes for sale and media outlets seeking relatively cheap aerial shots. But this use of drones - known in the industry as unmanned aerial vehicles or unmanned aircraft systems - is in a legal gray zone. Asked if a real estate agent using a drone to generate video of a home is breaking the law, a spokesperson for the FAA responded, "he could be." For now, drones cannot currently be used for explicitly commercial purposes. The Association for Unmanned Vehicle Systems International (AUVSI), an advocacy and lobbying group for the industry, has pushed lawmakers to allow farmers, Hollywood filmmakers, food-delivery companies (including one Bay Area startup that wants to operate a drone "TacoCopter") and others to legally use drones in their business. It forecasts that if the industry is allowed to flourish, the drone industry will grow nearly 600 percent by 2025, to a value of $82 billion, creating 100,000 jobs along the way. "When I say the word drone, the first thing that probably comes to your mind is something that is military, something that is hostile, something that is weaponized," said AUVSI president and CEO Michael Toscano, who strongly prefers the term "UAS," for unmanned aerial system. "Well, these are the farthest from that." He noted that some drones weigh no more than a pound and will be used for precision agriculture and search and rescue missions, not dropping bombs. "They are an extension of the eyes and ears and hands of a human being, that allow them to do those dirty, dangerous, difficult and dull missions out there," said Toscano. The agency is also working with experts at the Defense Department, NASA and elsewhere to try to ensure that drones can be operated safely in U.S. airspace by the 2015 deadline. It's no small task: Last September, a Government Accountability Office report found that drones are not yet able to avoid other aircraft and that there are "[c]oncerns about national security, privacy and interference with Global Positioning System signals." Still, there is no question that the technology has dramatically improved - to the point that one company in South Africa plans to use drones to deliver beer at an upcoming music festival. A British drone company recently announced a system in which a drone can follow you (via your mobile phone's signal) to capture your every movement on video. The industry is in the middle of a gold rush - the former editor of Wired magazine, Chris Anderson, left the publication to found a drone company, one of hundreds that have sprung up in recent years - and it is generating drones in all shapes and sizes. "The sky," Anderson said recently (and a bit ominously), "could be dark with these things." The latest drones can be small enough to fit in a pocket or larger than a person; they can look like model airplanes, miniature helicopters or something else entirely. (Some of the smallest drones look like a hummingbird or even an insect.) They can cost as little as a few hundred dollars or as much as a few hundred thousand; some can be operated using touch screens that show their positioning and real-time data collection. While the government has not sanctioned the commercial use of drones, the FAA did issue more than 1,000 waivers between 2009 and 2012 to public entities (including law enforcement) to operate drones. They are currently being used for border and port surveillance by the Department of Homeland Security, for research by NASA, and by state universities in conducting research. Proponents point to a range of beneficial - and uncontroversial - uses for drones. They can help in the search for a missing hiker more efficiently than a human and monitor wildlife more cheaply than a helicopter. They can help firefighters find for "hot spots" in a burning building from above. They can cheaply transport drugs and medical equipment into otherwise inaccessible areas around the world. Last week, Canadian police announced they had used a drone to locate and treat a man hurt in a car accident in a remote area - in what may have been the first instance of a drone saving a life. "Anytime you hear a search is called off due to bad weather, due to darkness, or the ability to make sure that you don't injury anybody who is searching for this person, that's where you'll see these systems," said Toscano of the drone lobby AUVSI. Critics, meanwhile, are sounding the alarm over the potential for law enforcement and regular people to use drones affixed with high-tech and infrared cameras, scanners and other sensors to conduct surveillance with relative ease. Cheap, easily accessible drones could mean "that Americans will be subject to persistent aerial surveillance every time they leave their homes," said Catherine Crump, a staff attorney with the American Civil Liberties Union. And it's not just surveillance that some civil liberties advocates are worried about: In an interview with The Daily last year, Chief Deputy Randy McDaniel of the Montgomery County Sheriff's Office - which owns a $300,000 ShadowHawk drone - said there are "certain situations it might be advantageous" to deploy drones affixed with tasers or chemical munitions rounds. Benjamin Miller, who directs the drone program at the Mesa County Sheriff's Office in Colorado, said he sees no operational benefit to armed drones. He also noted that in roughly 45 drone missions over four years, he has not once used the department's drones for surveillance. "It's not like we want to do surveillance now because we have unmanned aircraft. We really don't have a need for that," said Miller. He added that the drones are useful because they are the cheapest and most effective way to do things like crime scene reconstruction and search and rescue missions. Asked how hard it is to actually operate a drone safely - particularly amid heavy winds - Miller responded, "My children could fly the equipment that we use." He said there "absolutely" should be "some training" for anyone who wants to operate a drone but that it should fall far short of the training needed for a pilot's license. Toscano said there could be "some circumstances" where training is needed to operate a drone, but others where it may not be. He also noted that hobbyists can now legally fly model airplanes without a license. The prospect of unfettered drone surveillance by law enforcement officials is the rare issue that has united both the left and right. Four states have already passed laws limiting the use of drones by law enforcement, and drone privacy legislation has been proposed in 41 states. As lawmakers in Congress consider enacting federal legislation, the House Judiciary Committee subcommittee on Crime, Terrorism, Homeland Security and Investigations is holding a hearing today called, "Eyes in the Sky: The Domestic Use of Unmanned Aerial Systems." "We need laws in states and hopefully in Congress because courts move very slowly," said the ACLU's Crump. CBSNews.com took an in-depth look at the legal debate around domestic drones - and the legislative push to limit their use - in a story released yesterday. Check it out here.